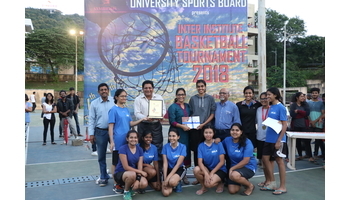 The SSLA Girls Basketball Team were victorious at the Symbiosis Inter-Institute Basketball Tournament. The first match was the Quarter Finals on the 6th of September and was played against Symbiosis Centre for Management Studies (SCMS). The team maintained had a consistent lead throughout the match and were victorious with a score of 21-13. The Semi-Finals were conducted the next day on the 7th of September against Symbiosis School of Economics. This was a close game, and although the SSLA team maintained a 2-3 point lead over their rivals throughout the game, the final score came to 16-17 in favor of SSLA. The Finals were conducted on the same day against the defending champions, Symbiosis Law School. The SSLA team managed to get a good head start with a consistent 3-4 point lead, with a final score of 20-17.